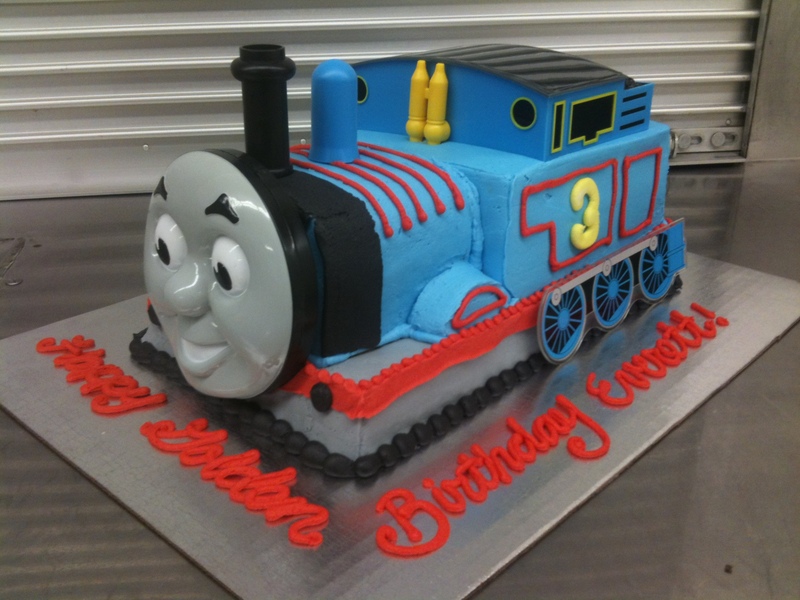 It’s A Thomas The Tank Cake, in 3D! Yum! A Thomas The Tank Cake! Chugga, Chugga, Choo! Choo! Here comes Thomas the Tank! This cake was for a very special golden birthday for a very cute 3 year old who loves Thomas the Tank. This is a great example of a copyrighted character that CAN be created in cake because of the purchased rights and accessories (like his face). Thomas’s face came with a cute keepsake DVD for the birthday boy to watch after cake and presents of course! He was iced in blue buttercream with white and chocolate cake inside. This little train feeds around 24-30 folks, so if you’re having a larger party, don’t forget to add on a few cupcakes! Do you know a child who loves Thomas too? Make sure to pre-order your cake 1-2 weeks in advance. Or if you have another copyrighted character in mind, just call to see if we can make it into a cake for you. Thanks! 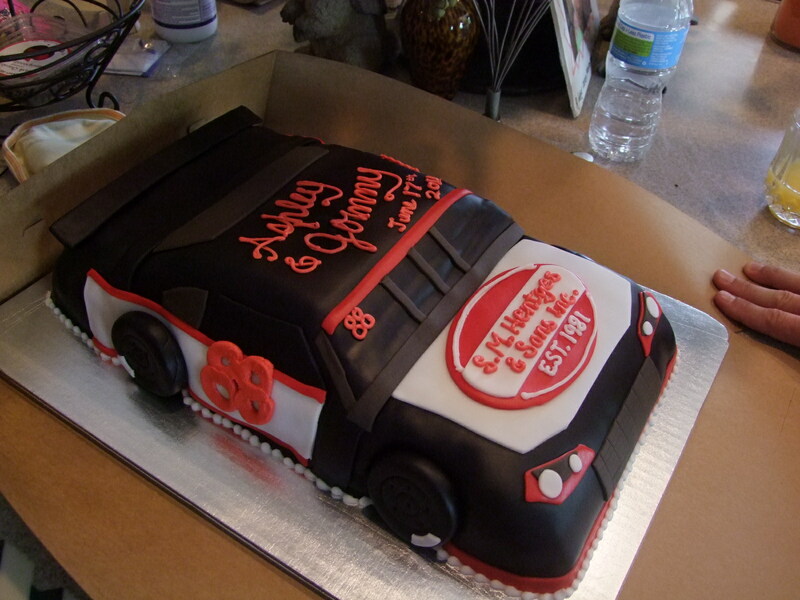 3D Race Car Groom’s Cake! Groom’s cakes are all the rage these days! They’re usually the non-traditional, custom created and ‘fun’ cake at the wedding. It can either be chosen by the Groom or in this case, a surprise for the Groom, ordered by his lovely wife-to-be. She wanted to have a truly special cake for him on their day and searched for a cake shop that could make a replica of the car that he drives and so Confectionery Cake Shop accepted the challenge and here it is! Vrooooommmm! A 70th Birthday Celebration… in 3D! You only turn 70 once, so why not celebrate in style?! Well, Harley Mankey from Owatonna turned 70 and his wife, friends and family threw him a surprise birthday he would not soon forget! If you know Harley, you’d know that you can find him right down the street at Mankey’s Outdoor Equipment and Appliances and if you’re lucky he still has one of those nifty Toro TimeCutter riding lawn mowers on hand. 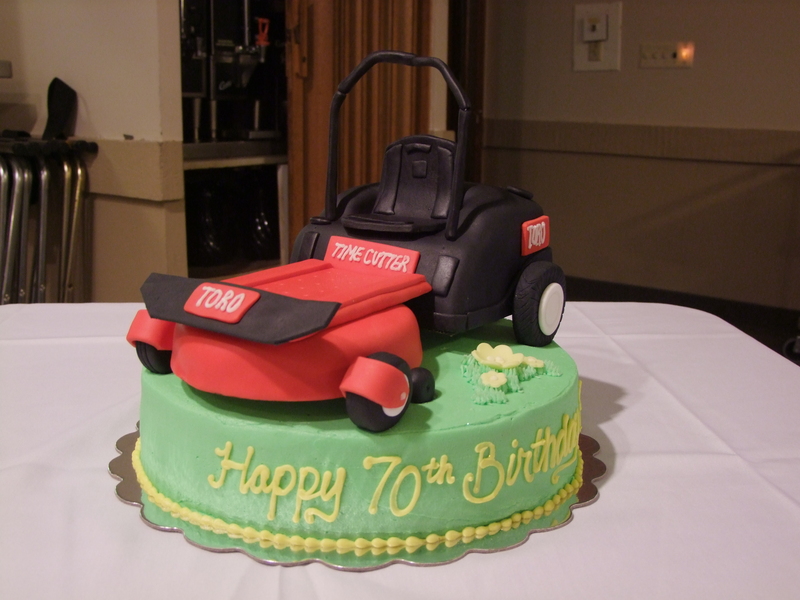 Although the party may have been a surprise, I’m sure it was no surprise for him to see a cake version of a Toro Riding Lawn Mower in the room! This chocolate cake was hand carved and covered in fondant. It sat on a lush green tuxedo cake, filled with raspberry mousse! The guest were all treated to a slice of sheet cake too, one filled with cream cheese buttercream icing and topped off with a little yellow flower on a patch of buttercream grass. Happy Birthday to a very special guy! As Liam was approaching his 2nd Birthday, we asked him one question – Red or Green? He said ‘green’ as his a big fan of John Deere tractors. Little did he know that he would be greeted at his birthday party by a 3D John Deere Tractor cake! As we set it up on site at his house, he happened to catch a glimpse of it on the table. Let’s just say there were lots of giggles, laughs and excitement in the room! 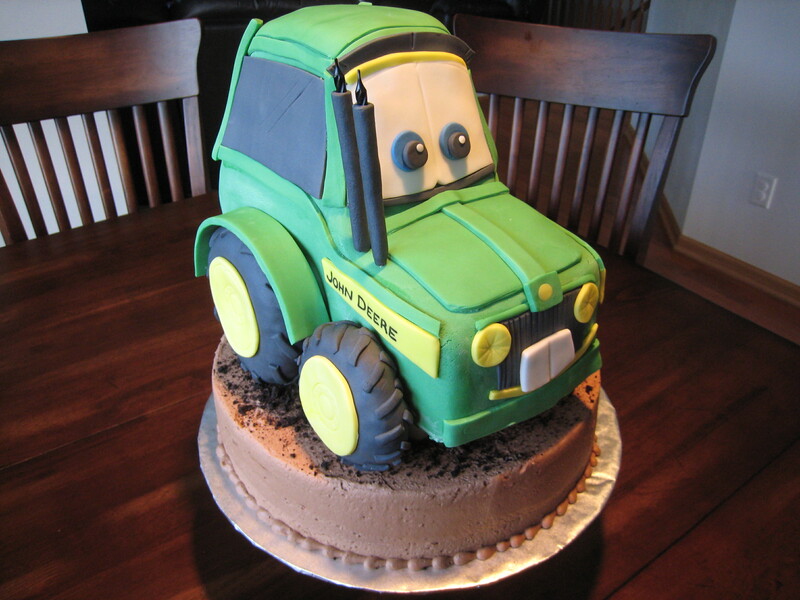 The tractor had fondant covered rice krispy bars for wheels and exhaust pipes that would double as birthday candles (which was a cool effect when he blew out the candles and smoke puffed from them). The inside of the cake was chocolate with layers of buttercream icing as a filling. The base was a white cake with raspberry mousse, covered in chocolate buttercream. Surely this was a birthday celebration that won’t soon be forgotten!